Louis Marie Malle (French: [mal]; 30 October 1932 – 23 November 1995) was a French film director, screenwriter, and producer. His film Le Monde du silence won the Palme d'Or in 1956 and the Academy Award for Best Documentary in 1957, although he was not credited at ceremony with the award instead being presented to the film's co-director Jacques Cousteau. He was later nominated multiple times for Academy Awards later in his career. Malle is also one of the few directors to have won the Golden Lion multiple times. Malle worked in both French cinema and Hollywood, and he produced both French and English language films. His most famous films include the crime film Ascenseur pour l'échafaud (1958), the World War II drama Lacombe, Lucien (1974), the romantic crime film Atlantic City (1980), the comedy-drama My Dinner with Andre (1981), and the autobiographical film Au revoir les enfants (1987). Malle was born into a wealthy industrialist family in Thumeries, Nord, France, the son of Francoise (Béghin) and Pierre Malle. He initially studied political science at Sciences Po before turning to film studies at IDHEC instead. He worked as the co-director and cameraman to Jacques Cousteau on the documentary The Silent World (1956), which won an Oscar and the Palme d'Or at the 1956 Academy Awards and Cannes Film Festival respectively. He assisted Robert Bresson on A Man Escaped (French title: Un condamné à mort s'est échappé ou Le vent souffle où il veut, 1956) before making his first feature, Ascenseur pour l'échafaud in 1957 (released in the U.K. as Lift to the Scaffold and in the U.S. originally as Frantic, later as Elevator to the Gallows). A taut thriller featuring an original score by Miles Davis, Ascenseur pour l'échafaud made an international film star of Jeanne Moreau, at the time a leading stage actress of the Comédie-Française. Malle was 24 years old. Malle's The Lovers (Les Amants, 1958), which also starred Moreau, caused major controversy due to its sexual content, leading to a landmark U.S. Supreme Court case regarding the legal definition of obscenity. In Jacobellis v. Ohio, a theater owner was fined $2,500 for obscenity. The decision was eventually reversed by the higher court, which found that the film was not obscene and hence constitutionally protected. However, the court could not agree on the definition of "obscene", which caused Justice Potter Stewart to utter his "I know it when I see it" opinion, perhaps the most famous single line associated with the court. Malle is sometimes associated with the nouvelle vague movement. Malle's work does not directly fit in with or correspond to the auteurist theories that apply to the work of Godard, Truffaut, Chabrol, Rohmer and others, and he had nothing whatsoever to do with the Cahiers du cinéma. However, it does exemplify many of the characteristics of the movement, such as using natural light and shooting on location, and his film Zazie dans le métro ("Zazie in the Metro," 1960, an adaptation of the Raymond Queneau novel) inspired Truffaut to write an enthusiastic letter to Malle. Other films also tackled taboo subjects: The Fire Within centres on a man about to commit suicide, Murmur of the Heart (1971) deals with an incestuous relationship between mother and son, and Lacombe Lucien (1974), co-written with Patrick Modiano, is about collaboration with the Nazis in Vichy France in World War II. The second film earned Malle his first (of three) Academy Award nominations for "Best Writing, Story and Screenplay Based on Factual Material or Material Not Previously Published or Produced". In 1968 Malle visited India and made a seven-part documentary series L'Inde fantôme: Reflexions sur un voyage and a documentary film Calcutta, which was released in cinemas. Concentrating on real India, its rituals and festivities, Malle fell afoul of the Indian government, which disliked his portrayal of the country, in its fascination with the pre-modern, and consequently banned the BBC from filming in India for several years. Malle later claimed his documentary on India was his favorite films. Malle later moved to the United States and continued to direct there. His later films include Pretty Baby (1978), Atlantic City (1981), My Dinner with Andre (1981), Crackers (1984), Alamo Bay (1985), Damage (1992) and Vanya on 42nd Street (1994, an adaptation of Anton Chekhov's play Uncle Vanya) in English; Au revoir les enfants (1987) and Milou en Mai (May Fools in the U.S., 1990) in French. Just as his earlier films such as The Lovers helped popularize French films in the United States, My Dinner with Andre was at the forefront of the rise of American independent cinema in the 1980s. Towards the end of his life, Malle was interviewed extensively for The Times by cultural correspondent Melinda Camber Porter. In 1993, the interviews were included in Camber Porter's book Through Parisian Eyes: Reflections On Contemporary French Arts And Culture. Malle was married to Anne-Marie Deschodt from 1965 to 1967. He had a son, Manuel Cuotemoc Malle (born 1971) with German actress Gila von Weitershausen and a daughter, filmmaker Justine Malle (born 1974), with Canadian actress Alexandra Stewart. He married actress Candice Bergen in 1980. They had one child, a daughter, Chloe Francoise Malle, on 8 November 1985. He died from lymphoma at their home in Beverly Hills, California, at 63 on Thanksgiving Day 23 November 1995. ↑ Archived February 8, 2015, at the Wayback Machine. ↑ Matsen, Brad (October 5, 2010). Jacques Cousteau: The Sea King. New York: Vintage Books. p. 129. ISBN 0-307-27542-6. 1 2 "BBC iPlayer". Bbc.co.uk. Retrieved 2015-12-01. ↑ "Louis Malle - Films & Bio". newwavefilm.com. Retrieved 22 July 2015. ↑ Bergen, Candice (7 April 2015). A Fine Romance. New York: Simon & Schuster. p. 5. ISBN 0-684-80827-7. ↑ Severo, Richard (25 November 1995). 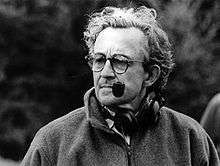 "Louis Malle, Film Director Equally at Home in France and America, IsDead at 63". The New York Times. The New York Times Company. Retrieved 19 July 2015. ↑ "Berlinale: 1984 Programme". berlinale.de. Retrieved 26 November 2010. Billard, Pierre (2003). Louis Malle: Le rebel solitaire. Paris: Plon. ISBN 2-259-19243-2. French, Philip, ed. (1992). Malle on Malle. London: Faber and Faber. ISBN 0-571-16237-1. Frey, Hugo (2004). Louis Malle. Manchester: Manchester University Press. ISBN 0-719-06456-2. Southern, Nathan; Weissgerber, Jacques (2005). The Films of Louis Malle: A Critical Analysis. Jefferson, North Carolina: McFarland. ISBN 0-786-42300-5.